Nenagh’s hugely competitive club matchplay ethos paid off yet again when they crushed Athlone 4-1 to claim their fifth AIG Purcell Shield title at Thurles and their second in three years. 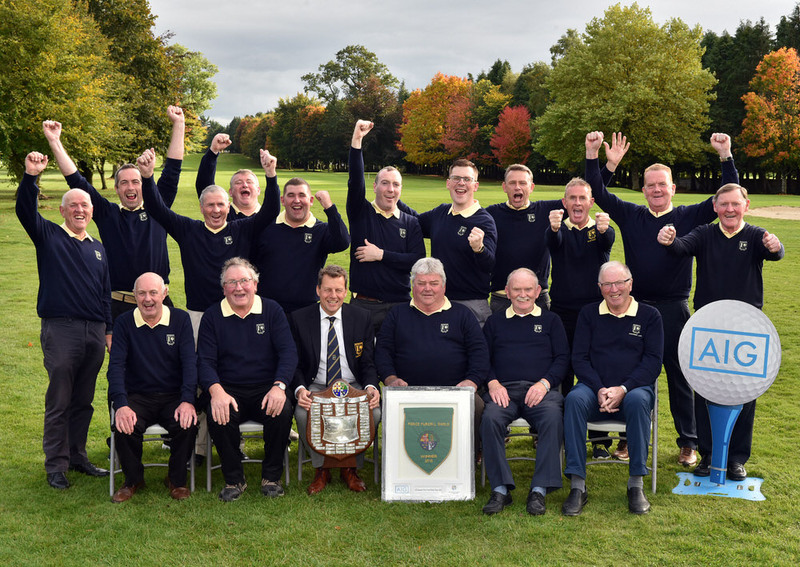 On a day when Athenry claimed the AIG Barton Shield and Kinsale beat Lisburn to join Hermitage in today’s Jimmy Bruen Shield final, Nenagh ruled supreme with another decisive victory. Convincing wins for Gerard Clifford and Tom Quinlisk and David Hickey and Martin Reddan left the Tipperary men just one point short of victory and while they were down in two matches, James Reddan and Pat J Hogan delivered the decisive point with a 5&3 win over Paul Burke and Declan Corcoran in the bottom match. “We are delighted,” said Nenagh joint manager Paddy Peters following an eighth successive win for a Munster club in the greensomes competition. Nenagh’s local knowledge — honed by competitive friendly match with the host club earlier in the season — proved to be worth its weight in gold for Nenagh. But the club’s matchplay tradition was also key to their success in a competition they had previously won in 1989, 1991, 1998 and 2016. “We play a lot of matchplay in our club and that's the basis for all our teams,” added Peters. “We have a great winter league going with as many as 150 playing in it, all matchplay. Athlone had 80 year old Tadhg Mannion in their ranks but Nenagh also had five old age pensioners in Packie Ryan, Toddy Hogan, Denis Corrigan, Jim Gleeson and Paul Maloney. They had enough strength in depth to win the Munster title and not call on two players who were eligible but remained with the Jimmy Bruen squad. "Munster is tough," Peters said. "If you get out of Munster in any of the matchplay competitions, you have a good chance, especially in the Jimmy Bruen Shield and the Pierce Purcell Shield. "Thurles were more than good to us during the year. They invited us over for a practice match, and it was a hell of a match, the hardest match we had all season. "We actually beat them in the Munster semi-final. They were upset over that and would have loved to be in the All Ireland finals they were holding in their own club." Their preparations were so meticulous that they even took their own buggy to Thurles by trailer and had their “red beast” on hand to zip between the chestnuts and oaks to keep tabs on their tireless troops. In the Jimmy Bruen Shield, Kinsale beat Lisburn 3.5-1.5 with 34-year-old Barry Dwyer hitting a clutch 100-yard wedge to eight feet at the last to set up a winning par with partner Brian O’Neill for a what was a decisive one-hole win over Trevor Murphy and Scott Rodney. “I've played in Croke Park and Thurles, but it was nothing like the pressure coming down the last when it's all square,” said cack-handed Dwyer, who won an All Ireland Club Hurling Intermediate Championship with Ballymartle in 2010. They will face Hermitage in this afternoon’s final after the Dublin club beat Tuam 3-2 with Richard Gladney and Louis Hemeryck coming back from one down after 15 holes to clinch a match-clinching two-hole win with a solid par-five. The action continues today with Dungarvan facing Royal Portrush and Portmarnock meeting Galway in the AIG Senior Cup semi-finals as Clonmel meet Fortwilliam and Portumna face Elm Park in the Junior Cup semifinals.